CHENGDU, China, April 15, 2019 /PRNewswire/ -- On the afternoon of April 11, the 2019 Promotion Conference for Chengdu Shuangliu Japanese-funded Enterprises (Shanghai), themed on "The Hub of Aviation Economy, The Premier Portal of Chengdu", was held in Shanghai by the People's Government of Shuangliu District, Chengdu Municipality. Representatives from over 70 enterprises such as Okura Garden Hotel Shanghai, BTG-Nikko International Hotel Management Co., Ltd., and SC Construction Machinery (Shanghai) Corporation, and the responsible persons of the Business Bureau of Shuangliu District and the Investment Promotion Bureau of Shuangliu District attended the conference. China and Japan are close neighbors. Since the Han Dynasty, exchanges and cooperation between the two countries have lasted for more than two thousand years. Since the formal establishment of diplomatic relations between China and Japan in 1972, economic and trade exchanges has become an important form of cooperation between the two countries, and a multi-level, multi-field and multi-form mutually beneficial cooperation pattern has been established. In order to consolidate and deepen the fruitful exchanges and cooperation between the two countries, on January 12 this year in Chengdu, Sichuan Province of China engaged a dialogue with Shikoku of Japan covering Hiroshima-ken, Okayama-ken, Ehime-ken, and Kagawa ken. The two parties jointly released the Declaration of China-Japan Friendship in Sichuan, opening a new chapter in friendly exchanges and cooperation between Sichuan and Japan. As the capital city of Sichuan Province, Chengdu is one of the nine central cities in China and the preferred place in the middle west of China for investment by Japanese investors. In recent years, 397 Japanese-funded enterprises including 38 of the Fortune 500 companies have settled in Chengdu, with the Japanese investment totaling over 2 billion US dollars. A large number of well-known Japanese companies such as Toyota, Kobe Steel, Sumitomo Electric Industries, and Seven & i Holdings have entered Chengdu in succession. They have not only been deeply integrated into the development of Chengdu, but also have yielded fruitful results. At the promotion conference, Mr. Ito Chiyuki, director of the Japan-China Economic Association Shanghai Office, delivered a speech, and Zhang Ruiqin, Deputy District Head of the Shuangliu District Government, introduced the Chengdu Shuangliu China-Japan Economic Cooperation Corridor. 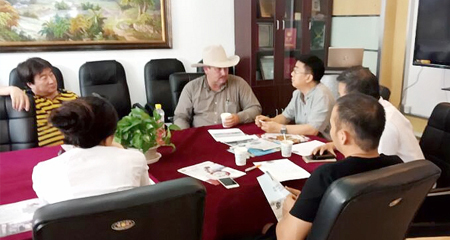 Representatives of Chengdu CEC Panda LCD Technology, SCCM, and Fujian Jiade Investment Development Co., Ltd. respectively introduced the development of their company in Shuangliu. It is reported that in order to promote the spirit of the Declaration of China-Japan Friendship in Sichuan to be implemented in Shuangliu, and to help deepen China-Japan economic and trade cooperation, Shuangliu is now fully planning to build the "China-Japan Economic Cooperation Demonstration Zone" that includes "China-Japan Industrial Cooperation Corridor" and the Shuangliu International Airport Business District. The Corridor and the Business District will be the core of which Shuangliu is making great efforts to construct. Shuangliu strives to build itself into a preferred place for Japanese-funded enterprises to invest in Sichuan and Chengdu. At the promotion conference, Xian Rongsheng, Vice Secretary of Party Committee of Shuangliu District and Head of the District, issued Investment Promotion Ambassador Certificate for Mr. Ito Chiyuki, director of the Japan-China Economic Association Shanghai Office and Jin Nakamura, director of the Shanghai Japanese Commerce & Industry Club. Xian also issued Certificate of Chief Planning Officer for Daimatsu Town, executive director of Nikken Sekkei Ltd and the president of Urban division, and Takagi Yiyu, design minister of Urban division of Nikken Sekkei Ltd and Chief Planning Officer of TOD. Chen Jianlin, Deputy Director of Shuangliu District, on behalf of the People's Government of Shuangliu District, signed investment cooperation agreements with BTG-Nikko International Hotel Management Co., Ltd. and Komatsu. BTG-Nikko International Hotel Management Co., Ltd. and the People's Government of Shuangliu District has lined up a partnership proposing to build a Nikko hotel in Shuangliu District to be operated by Okura Nikko Hotels Management Co., Ltd.; Komatsu and the People's Government of Shuangliu District reached an agreement on cooperation on building Komatsu's headquarters in Shuangliu.